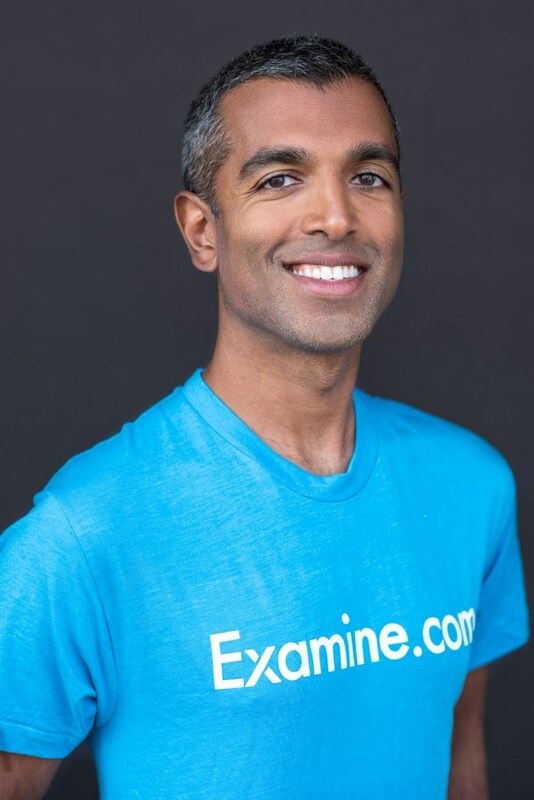 Kamal Patel is the co-founder of Examine.com, the Internet’s largest database of nutrition and supplement research. He’s a published nutrition researcher, with specific interests ranging from vitamin D to the gut microbiome to the impact of diet on chronic pain. Two questions weigh heavily on Kamal’s mind. First, given the thousands of important studies published each year, how can the average person keep up, while still focusing on what’s most important for themselves? Second, how do all the various aspects of diet and health fit together, given the complexity of nutrition science all the way from the micro level (nutritional biochemistry) to the macro level (nutritional epidemiology)? Answering those questions is both Kamal’s favorite hobby and his job as co-founder and director of Examine.com. He’s published peer-reviewed studies on a variety of topics, from vitamin D and cardiovascular risk to fructose and liver health. But no single study is enough to explain major facets of health. Thus, Kamal’s views on research (and life) can be summarized by Maimonides's timeless saying: “Teach thy tongue to say ‘I do not know,’ and thou shalt progress.” All too often, experts overestimate their own knowledge and certainty. Kamal steers the Examine.com team towards a big picture perspective, interpreting evidence with caution and objectivity. He holds two master’s degrees from the Johns Hopkins University, in business and in public health, and is on hiatus from a PhD in Nutrition during which he investigated links between diet and chronic pain. From 2008 through 2010, Kamal was a part of the team contracted by the Institute of Medicine to systematically review vitamin D and calcium evidence for the revised Dietary Reference Intakes. He was also a primary reviewer for the largest clinical trial registry in the world, clinicaltrials.gov, checking to make sure registered clinical trials were methodologically sound. Kamal has had widespread chronic pain for over ten years, stemming from the genetic condition Ehlers-Danlos syndrome (EDS) and failed joint surgeries. Other than curtailing his once-favorite hobby of powerlifting and taking away hard-earned muscle mass, EDS has also given him perspective. Seeing an increasing number of family and friends deal with difficult chronic conditions that impact daily life, he’s emphasized an empathic and informative approach when covering chronic disease topics on Examine.com. Under Kamal's guidance, Men's Fitness cited Examine.com as a game changer in the fitness space, and Fast Company awarded Examine.com as one of the most innovative companies in health and fitness. Kamal and Examine.com have been quoted or mentioned in many major online and print publications, including the New York Times, Washington Post, Forbes, BBC, The Guardian, Men's Journal, Men's Health, Men's Fitness, Muscle & Fitness, Men's Journal, The Boston Globe, Huffington Post, AskMen, Bodybuilding.com, and the Academy of Nutrition & Dietetics. Kamal has frequently spoken at nutrition and fitness conferences on both nutrition topics, such as the latest evidence on red meat and cancer risk, and supplement topics, such as synthetic nutrients versus food-based nutrients. Under Kamal's direction, Examine.com has become one of the most trusted and respected nutrition organizations. With a total of over 20 contributors, Kamal and his team are always learning, eager to mine the latest evidence for gems that are applicable to readers in different stages of health and fitness. Kamal lives in San Francisco with his significant other, a professor at the University of San Francisco. He spends the majority of his time reading, digesting, and having ‘aha moments’ among a stack of research papers. Outside of nutrition, Kamal is an avid self-experimenter, rabid basketball fan, and devotee of mindfulness and compassion. If you would like to contact Kamal Patel, please send an email to [email protected] Note that while he will read your email, he cannot answer every single email. Also, please note that no personal medical advice is given by Examine.com. See the full Examine.com team.